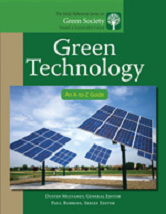 Explores the essential role of technology and its most recent developments toward a sustainable environment through subject entries. Twofold in its definition, green technology includes the changing of existing technology toward energy conservation as well as the creation of new, clean technology aimed at utilizing renewable resources. Includes a chronology, introduction, resource guide, and reader's guide.